Illustrated Istanbul is a magnificent volume of 450 black and white photographs of the city curated by Orhan Pamuk, an enriched edition of his memoir Istanbul: Memories and the City. In the twelve years since the publication of Istanbul: Memories and the City, Orhan Pamuk has continued to add to his collection of photographs of Istanbul on themes like melancholy, the black-and-white aesthetic, provincial poverty, post-imperial despondency, and the desolation of architectural ruin. 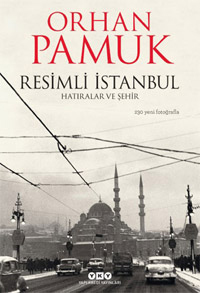 Now, Pamuk has selected a range of photographs from this collection for Illustrated Istanbul, linking each new image to his memoir. This lavish selection of 450 photographs, featuring contributions from Ara Güler and Henri Cartier-Bresson, the Greek Samancı Brothers, itinerant European photographers, and local news reporters, and dipping into the archives of Istanbul’s characteristic photography collectors, also contains previously unpublished family photographs from the author’s own archives. It is a sumptuous volume, a collection of dreamlike images of Istanbul chosen by Pamuk himself.